This is a sponsored post on behalf of Horizon Organic. Sometimes, my toddler feels a little left out. She’s the only one at home with me during the day, and – quite frankly – mom isn’t as fun as her older brothers and sisters. They get to do ALL the cool things, like go to school, play with friends, eat in the big cafeteria, go out for recess, etc. They get to have all these school-time adventures without her, and I know that she feels left out, and misses them terribly. We do our best here at home, but she’s not ready for pre-school or any sort of daycare yet (she’s afraid of strangers). I know she’d probably do a lot better with sibling or two, but they’re all in school. We sometimes arrange playdates with baby friends around the neighborhood, and go for walks and park playdates when the weather permits, but she sticks close to me when we do. When we’re flying solo, I try to make it fun and cool here at home with me as much as I can, and that includes giving her a backpack, “homework,” and a fun school lunch, too. It doesn’t have to be complicated to be fun. That’s what Operation Awesome School lunch for my school-aged children is all about – uncomplicated lunches of awesome the kids enjoy that break up the monotony of bland sandwiches. Sometimes, it’s leftovers for lunch (like the school age kids get), or, sometimes, it’s her favoritest food on the planet – macaroni and cheese. I love that it’s quick and easy, tasty and cheesy. It’s a perfect cold weather food to enjoy together at the table, and it’s easy to prepare if I have a busy day of writing and conference calls, too. 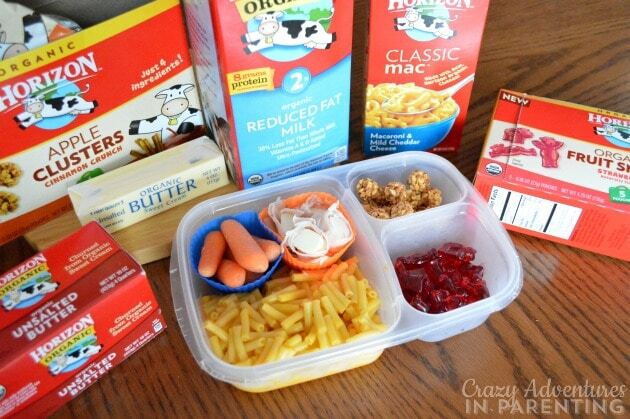 In fact, the new Horizon Organic snacks are perfectly portioned for my kids’ snack needs in their lunch boxes! I’m particularly pleased that one box makes enough for our lunch plus leftovers for the school kids to snack on, too. They can eat the macaroni and cheese as it is, or we can add a few fun ingredients to make it even tastier, like diced ham or crumbled bacon. Orrrrrr, I can make one of the kids’ favorite dishes – Bacon Macaroni and Cheese Grilled Cheese. YES! I love how super easy this is to make! Two slices of buttered bread, two pieces of cheese, leftover mac and cheese, plus crumbled bacon equals and amaaaazing snack for the mid-afternoon tummy grumblies when it’s still many hours until dinner! My kids devour it! (Heck, who am I kidding, my husband and I do, too). If you’re looking for fun ideas for meals for your kids, check out Horizon Organic’s brand new Meal Solutions Pinterest Board for inspiration. Be sure to follow them on Twitter and Facebook, too. What Horizon Organic products do you enjoy for your family?